The 2018 Danbury Irish Festival will be a 3-day indoor/outdoor event in a new location! They’ll have live music all weekend long, cultural activities & events, a shopping village, fun children’s entertainment & activities, a chance to win big in their raffle & delicious food, drinks and live entertainment all weekend long! *Please note: No outside food or beverages allowed. Bags will be checked. No pets are allowed. Location: 65 Sand Pit Rd, Danbury, CT.
Stop by our Hospitality Tent for Fresh baked goods, Irish Soda bread. We will also have refreshments including tea, coffee, hot chocolate, iced tea, soda, and water. This year’s hospitality tent will be located outside next to the Cultural Tent and Children’s Tent. UK Gourmet sells food from England, Ireland (Northern & The Republic of), Scotland and Wales, all shopping in harmony. It is food that brings us all together! Designs By Diana, Celtic, handmade jewelry by Diana and Pete Burnham (860) 916- 1379. Twenty-one years ago, Gerry Curran, who was the President of the Danbury Division of the Ancient Order of Hibernians, had a dream. Gerry’s dream was to bring an Irish Festival to Danbury in order to present and perpetuate Irish music and culture. Gerry convinced the President of the Danbury Division of the Ladies of the Ancient Order of Hibernians, Sharon Higgins, that this was worthwhile project. Together, Gerry and Sharon shared their ideas with the men and women of the Danbury Ancient Order of Hibernians (AOH) to support and work to establish an Irish Festival. Any profits would be used to establish an Irish Cultural Center in Danbury. Gerry’s dream to establish an Irish Festival became a reality in 1995 when the Greater Danbury Irish Festival made its debut in Rogers Park. The festival subsequently relocated to the Ives Center and continued there until 2011 when bad weather and financial difficulties caused it to downsize and be held for several years at the Lake Avenue Irish Cultural Center. The Irish Festival is now held on the beautiful grounds of the Portuguese Cultural Center in order to accommodate many bands, events a dn parking and not have to worry about Mother Nature’s mood swings! For more information please email danburyirishfest@gmail.com or call (203)739-0010 or (203) 501-7424. 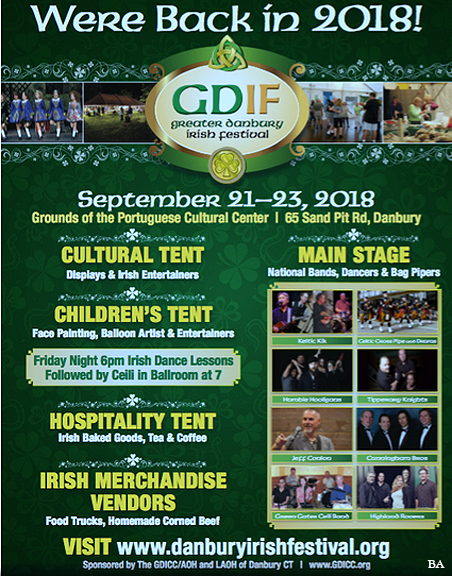 The Greater Danbury Irish Festival will be held Sept, 21, 22 & 23, 2018 at 65 Sand Pit Road, Danbury, on the grounds of the Portuguese Cultural Center. The center is conveniently located off I-84, exit 5 , 6 or 7, making us easily accessible from all points in Connecticut and Putnam, Westchester and Rockland counties in New York, as well as New York City. We can be reached by Housatonic Area Transit (HART) buses and Metro-North trains. GPS Address: 65 Sand Pit Road, Danbury, CT.